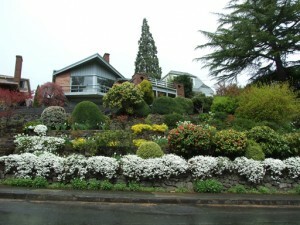 Admirable Landscapes is a small Landscape construction and maintenance company serving NE Portland. Landscape design and consulting can be conceptualized by any number of NE Portland landscape design companies and completed by us. We specialize in working with your small landscape design provider and creating the landscaping masterpiece that was once only on paper. “Landscape design” sounds rather imposing. To be sure, one could spend years studying all the ideas in the field of garden or landscape design. But what about the DIY’er who wants to give a front yard a makeover or wishes to tinker with designing a garden? If you need to spruce up the landscape design of a house you’re selling, or if you simply want to enjoy an enhanced beauty in the privacy of your backyard, you could profit from a straightforward look at the ideas behind designing a garden, supplemented with hands-on project guides. If you have a large projects we have Companies we collaborate with.